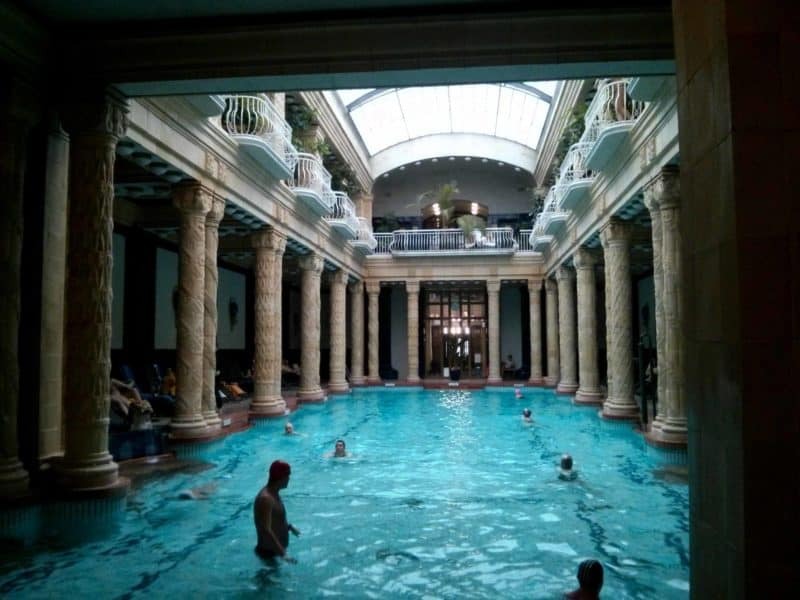 On my most recent visit to Budapest, I decided to visit the Gellert Baths. 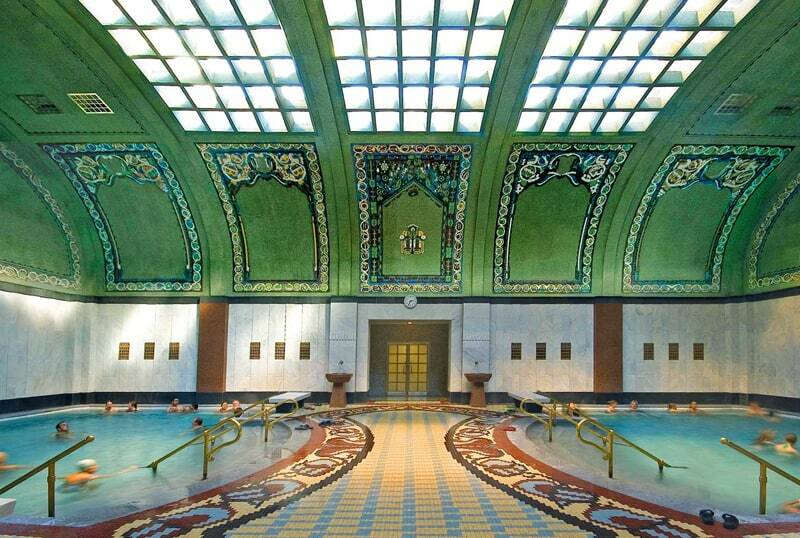 Located adjacent to the world famous Gellert Hotel at the base of Gellert Hill in Buda, the Gellert Baths were built between 1912 and 1918 in the Art Nouveau style. My visit got off to a bad start. I entered through the wrong door and got terribly lost inside. Nothing like wandering around in your street clothes while everyone else is in their bathing suits as they stare at the crazy foreigner that doesn’t know what she is doing. I eventually found the change rooms, but that was after asking a number of people how to get around. The entrance hall – the correct entrance is in the rotunda in the middle of the building. Once I got in the waters, things drastically improved. 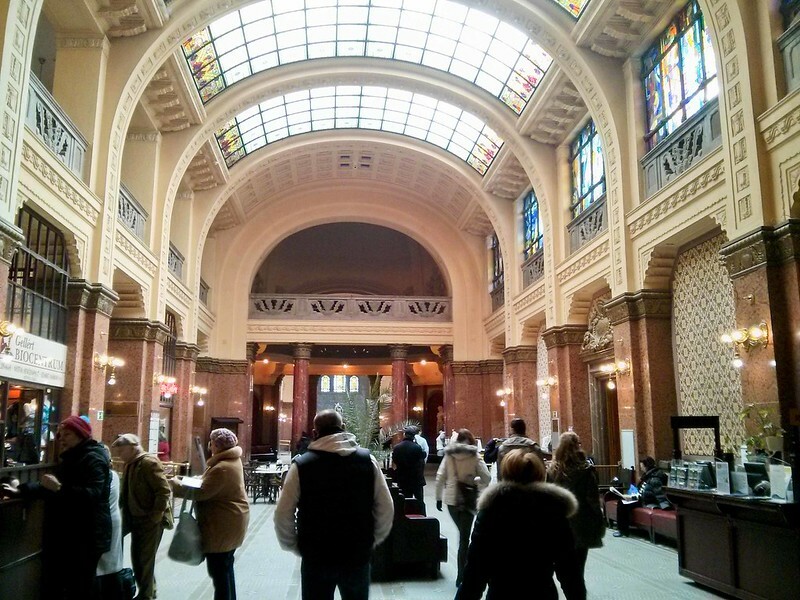 Gellért is famous for its main hall with gallery and glass roof, built in Art-Nouveau style. It truly is beautiful to be in the room. There are twelve pools including six thermal pools with temperatures from 35°C to 40°C, a swimming pool and a wave pool outside (which was closed during our visit). The waters contain minerals that are said to heal inflammation, arthritis, circulatory diseases and other illnesses. The thermal baths are difficult to locate as they’re hidden on either side of the mail hall. You need to walk through a massage area before you can access them which is kind of strange. You feel like you’re walking in the wrong place, but then you turn the corner and you see the baths. The hotter baths have written on the wall the maximum length of time you should spend in them. The 40°C pool had a recommended time of 5 minutes. I could barely stand 2 minutes! I started sweating profusely and had to sit up on the edge because it was too hot. Even sitting in a 38°C pool, just above body temperature, was hard. I found it uncomfortable and yet oddly comforting. After a couple of hours of soaking, I was feeling really relaxed. Towards the end I start dozing off. I probably could have fallen asleep in the water. I was half heartedly listening to the Boy chatter away, instead focusing on staying awake and not face planting into the water. It was with reluctance that I finally left the warm embrace of the waters. Getting out was another adventure and a half. I managed to lock myself out of my locker all because it didn’t close properly. I had to wait forever at the help desk (hurray for Hungarian customer service), before someone finally was able to come and help me. The lady hit my locker a couple of times and it came loose. At least I had my clothes on at this point! The rest of the day I was so relaxed. My muscles were warm and buttery. The sensation of moving and floating on water didn’t leave me the whole day. Even the next day traveling home my muscles felt super relaxed and comfortable. Writing this now, I really want to go again. It was pure bliss. Ready to go? 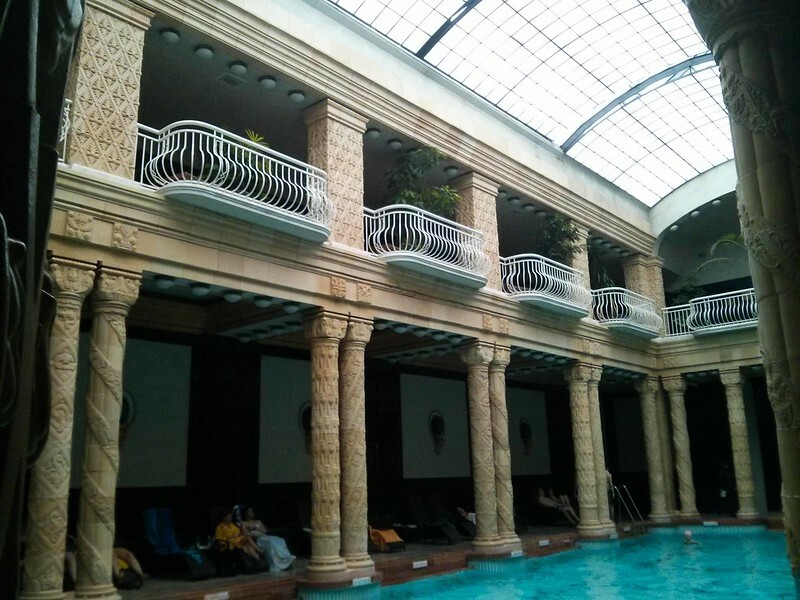 Check out my follow up post with 9 tips to make your visit to the thermal baths effortless. Enter through the right door! I made the mistake of not listening to the cashier about which door to enter. She said the second door on the left, except all the entrances were on the right. So I picked one which turned out to be horribly wrong. The correct entrance is the middle door, right in front of the swimming pool. It is the second door on the right. The cashier mixed up her left and right and then I got horribly lost inside the maze of Gellert. The thermal baths inside at Gellert at one point were separated by gender and you’ll see that reported around the web. Effective January 1, 2013 this is no longer the case – the facility is all coed now. I was there in February 2014 and encountered no separation. At the time of writing tickets cost 4900 HUF on weekdays, 5100 HUF on weekdays for a locker. If you decide to get a cabin it is 5300 HUF on weekdays and 5500 HUF on weekends. A cabin is essentially a private change room where you can also lock your belongings. For the latest prices, check out the Gellert website. If you have a Budapest card, you can get 20% off your admission price. It is accessible by public transportation on tram 18, 19, 47 and 49, or on buses 7, 7A and 86. Have you been to a spa like this? Did you find it as confusing as I did? What an awesome experience! I have such low tolerance for extreme temperatures, I’m not sure how long I would last in the 40 degree bath. But I would love to go, even if it’s just to admire the beautiful architecture. It’s so nice to be relaxing in the water and taking in all the beauty around you. The 40 degree bath really was too warm. Beautiful! I love visiting thermal baths and the ones in Budapest look amazing. Its definitely a must visit if you ever get the chance! Haha, everyone was probably judging me harshly. I freak out whenever I go in a sauna so I totally get your panicky feeling. I can’t even count the number of times I’ve dashed out of a hot sauna mid panic much to the dismay of my boyfriend. Wow this is awesome! I have to go there ~ really gorgeous! When we first moved to Europe the whole naked bath thing was a real challenge for me! Love your story! Got to Go! Gellert use to be clothing optional as well. I don’t think I would have gone if it still was. That is a little too much skin for me. Thanks for the tips on finding the baths – definitely not an easy task! I didn’t make it there during any of my stops in Budapest, but it is on my list the next time I’m in Hungary. Awesome! You definitely won’t regret it. Great post! I recently went for a Turkish bath in my adopted city of Athens. I loved the experience. I hear Hungary has the best baths in Europe. Made me want to go now – thanks! How were the Turkish baths? I’ve heard they’re really different. You should definitely go to the ones in Budapest! That main hall is beautiful! I don’t know how long I would last in the really hot waters before getting all headachy and dizzy. But the not so hot ones sound wonderful for relaxation. If I go, I’ll have to remember to go in the correct door. Thanks for the clarification at the end. As someone who is prone to headaches in hot temperatures, I surprisingly didn’t get a headache. The hotter ones were uncomfortable, but the 36 degree one was just perfect. Seriously you could just write about Hungary forever and I would read everything. I want to live in Budapest because of the bath’s. We’ve got some near(ish) to us, and I love it but they’re not as awesome as the ones I went to in Hungary. Haha, thanks Sammi! 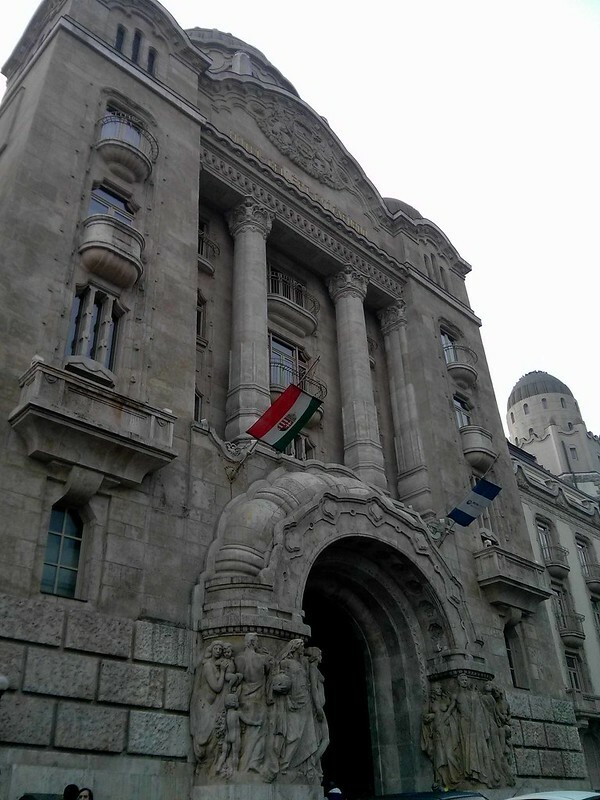 I still have a couple posts coming about Budapest. It’s a great city to live in so if you ever get a chance I’d highly recommend it. What a beautiful place. I am always cold so I dont think I would mind the hot water so much. Great pictures! You’ll love it here then. The water is sooo comforting. I went to a lot of hot spring baths while I lived in Japan, but it sounds like this is a bit of a different experience – definitely looks grander. I’ll have to remember to visit next time I go to Budapest! I’ve heard about the hot spring experience in Japan. I would love to try it out one day. Another one to bookmark for our intended visit to Budapest in April. This looks so great. One question…are children allowed in? thanks for getting back to me, we’ll definitely go then as we can take the kids! Have a great time! Both Széchenyi and Géllert have adventure like pools that your kids will love. Széchenyi has a great whirlpool that really pushes you along and Géllert has a wave pool. You should also check out my follow up post to this with tips on how to make your visit to the thermal baths easier and effortless. Great post Adelina. We only went to Széchenyi, but had a fantastic experience there as well. We heard really good things about Gellert but didn’t have enough time. It looks like you had just as fun (and confusing) an experience as us. Thanks for sharing as always! Safe travels! I went to Szechenyi as well and I found it slightly less confusing compared to Gellert. Either way, its definitely an experience! Oh, I am incredibly jealous! I have been to the Szechenyi Baths about a dozen times (when I was leading tours) but never to Gellert, despite my best intentions of going there during my time off. I just got incredibly lazy and never worked up enough energy to get to the other side of the river! Looks so beautiful and I really regret my laziness. I think I like Szechenyi more than Gellert, but either one is great for relaxing and soaking in the waters. I’m so jealous you’ve been so many times! Oh, I loved Gellert when I was there. But I must say that the Szegenyi baths were even more fairytale like. Love your pics! Thanks Esther! I agree, there is something about Szechenyi that Gellert just doesn’t have. Put it on your to do for your RTW! We must have had the same receptionist as when I went. I too got lost.. and I walked into the MENS SIDE!!! Yikes. Lucky it was empty as I went midweek and in the off season – I hope to get back one day. Ugh! So frustrating! At least it was empty! I can’t imagine what would have happened if there were people there. haha i feel like that would happen to me too, getting lost and being that tourist everyone stares at. Oh well, things happen but at least you got to enjoy them! Oh man, I need some relaxation right now – this sounds wonderful! And the building is beautiful.